Italian composer. While a chorister at Brescia cathedral he studied with Giovanni Contino. For nine years from 1578 he served Cardinal Luigi d'Este in Rome as musician and later choirmaster, making contacts at the Cardinal's brother's court in Ferrara. He was in Florence in 1588-9 and contributed to the music for the intermedi performed at a celebrated court wedding of 1589. In 1594 he came under Cardinal Aldobrandini's wing and met the poets Tasso and Guarini; the following year the Cardinal arranged his appointment to the King of Poland, at whose court in Warsaw he worked in 1596-8. By the time of his death a year later he was back in Rome as a Papal court musician. 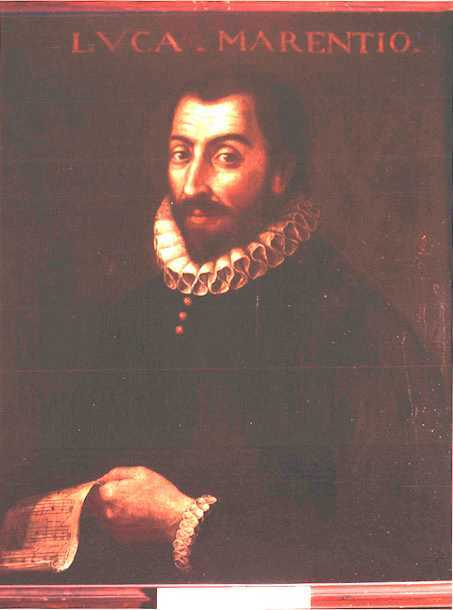 Marenzio was the greatest of those Italian composers whose fame rests entirely on their madrigals; his output includes no fewer than 500 such pieces and 80 villanellas, not to mention a small quantity of sacred music. The Rome in which he spent so much of his life was a thriving centre of amateur madrigal singing, which provided a ready market for the steady flow of madrigal books that he published from 1580 onwards. From the outset he showed complete fluency and mastery in setting light pastoral verse to music that combines an intimate response to the words with deft counterpoint and pleasantly varied rhythms and textures. Later Marenzio came to favor more serious, even morbid, texts and to write in a style that was at once austere and intense, making full use of dissonant and chromatic harmonies and yet hardly departing from a chaste, even flow. The majority of his madrigals are for five voices, with many for six and rather fewer for four; in the larger textures he increasingly uses the top two as equal high voices in an almost 'concerted' manner. Marenzio's madrigals made an immediate impact in England, and enormously influenced the English madrigalists; some were issued in Yonge's Musica Transalpina of 1588.